The technology behind Oxyrase was discovered by the late Dr. Howard Adler and his colleagues at the Biology Division of Oak Ridge National Laboratory in Tennessee. Dr. Adler and his team found that cell-membrane fractions – derived from Escherichia coli and related microorganisms – were able to reduce oxygen, directly to water and capable of creating an anaerobic environment when added to any liquid or solid culture media. 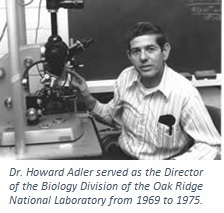 Click here for a copy of Dr. Fung’s tribute to Dr. Adler in the Journal of Rapid Methods and Automation in Microbiology. The result of this discovery was, Oxyrase® – the Enzyme System! This groundbreaking discovery made possible a novel method for making media specifically prepared for anaerobes and in some cases, for working with anaerobe microorganisms in an aerobic environment. On April 28, 1987, Drs. Adler and Copeland together with Mr. Weldon Crow, founded Oxyrase, Inc. to commercialize this technology. Over the years, numerous people have found the Oxyrase® Enzyme System a favorable solution for their particular application. Oxyrase has wide applications for removing oxygen from many different environments. Under Dr. Copeland’s leadership several enhancements to the company’s product offering and core technology were realized. This includes the development of the innovative OxyDish™ which Dr. Copeland, Dr. Adler and Mr. Gerald Spady completed in the late 1990s, affording microbiologists a more cost effective method for creating and controlling an anaerobic environment when growing anaerobes. Today, we honor the history and legacy of our past, while continuing to expand the applications for our technology. Oxyrase, Inc. is fortunate to have earned the trust and partnership we enjoy with our associates, customers, business partners, and community. We look forward to continuing our shared success. The uses for Oxyrase are limited only by our imaginations. To learn more about Nature’s Antioxidant®, please explore our website or contact us at info@oxyrase.com.